RPNow: Unable to proceed and receiving a message regarding "youcam"
If you are receiving an error or message regarding "YouCamService” or "youcam" when taking an RPNow exam, please follow the steps below. Method 1: Eliminate the YouCam Process. Windows 8 User's may need to click "More Details" so they can access the "Process" Tab. Please attempt to take your RPNow exam. If you continue to receive the error message proceed to the next method. 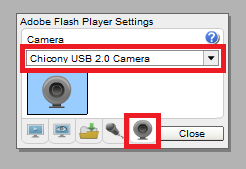 When accessing the Remote Proctor Now software you will receive a prompt when Adobe Flash tries to connect to your WebCamera and take your picture. 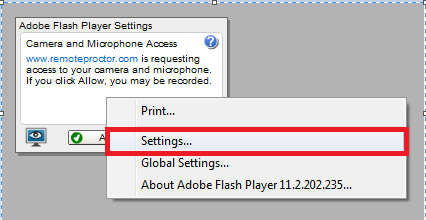 Please follow the steps below so that you have the appropriate settings for Adobe Flash Player to work with the Remote Proctor Now software and eliminate this dialog in the future. a. 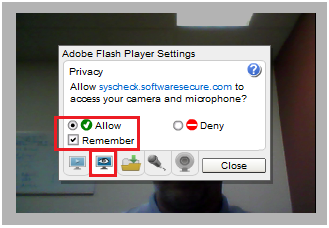 When you receive the prompt for Adobe Flash Player Settings you should Right-Click in the white box. e. Select the proper "Camera" that you are using. NOTE: If you have an incorrect Camera setting it can cause the software not to function. g. Continue through the steps to access your exam. You have now allowed Adobe Flash to connect properly and you should not receive the “Adobe Flash Player Settings” in the future, when accessing the Remote Proctor Now Software. Please attempt to take your RPNow exam. If you continue to receive the error message, or if you have any further questions, please contact us back.